My year without beer is rapidly coming to an end (today in day 362 of 366!). Ten days ago I asked “Can You Stay Off The Booze For 31 Days?” and highlighted how Alcohol Concern is prompting people to start 2013 feeling better, saving money and making a difference by ditching the hangover, reducing the waistline, and giving up booze to raise money for their charity. 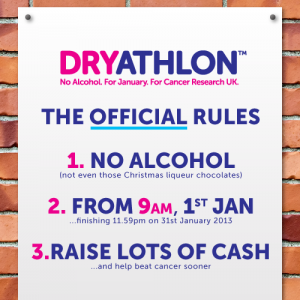 Well, now I have discovered that Cancer Research UK, one of the charities I have been supporting during my year without beer has launched something similar – The Dryathlon! Have you got the guts to turn your back on the bar for the whole of January? If yes, then you could help Cancer Research UK by becoming a “Dryathlete”. Cancer Research UK is asking you to test your willpower, donate the cost of a few bevvies, get sponsored, start a team or challenge a mate to see who can stay on the wagon. Based on my experience of a year without any alcohol I agree with Cancer Research UK when they say you will feel fitter. 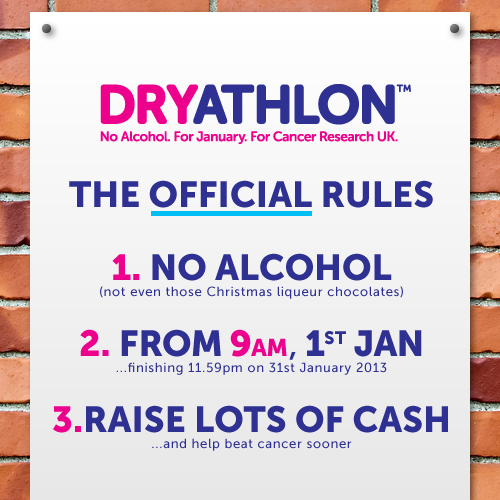 Oh and if you manage to raise enough you might collect Dryathlon™ trophies or be crowned top of the team leaderboard! Unlike my year without beer that has been strictly alcohol free for the entire duration, the Dryathlon actually allows a “Golden Pass” where you can have a night off from the Dryathlon in exchange for an additional donation. So what are you waiting for? Sign up here! Don’t think you can make it? If you don’t think you would last 31 days without booze, then how about showing some love for my whole year on the wagon! Oh and if giving up all alcohol for a year isn’t enough of a challenge to make you dig deep and show your support, I’ve also completed a challenge to run 500 miles! As part of my running challenge I have completed a quarter marathon, a 10 mile road race (Great South Run) and an 8 mile off road challenge (The Grim Original).